The flag has a Union Jack in chief, defaced with a five-pointed crown, the field is wavy white and blue with a rising sun. Adopted 20 July 1960. ratio 3:5. Civil and state flag on land. The designs seen on the British Columbia flag are called the Arms of the Province. The wavy blue bars symbolize the Pacific Ocean, and the sun represents the glory of the province. The Union Jack, with the antique golden crown at its centre, reflects the Province's colonial origins. The 1906 Royal Warrant, which granted the Province's official Arms, allowed for them to be used "on Seals, Shields, Banners, Flags, or otherwise according to the Law of Arms." The design for the flag was prepared at once, and the display officially authorized in 1960 by Order-in-Council. I went to the British Columbia government site and read this same account. Another interesting version I learned in school here was that the setting sun symbolised the fact that we were the western most part of the British Empire. Another account of the sun on the British Columbia flag (perhaps supplementary to the others) is that it relates to the motto on the province's arms, "splendor sine occasu," or something like "splendor without setting (i.e. of the sun)." The arms of British Columbia are "Argent, three bars wavy azure, issuant from the base of a demi-sun in his splendor or, on a chief of the Union Device charged in the centre point with an antique crown or. ... the motto 'SPLENDOR SINE OCCASU' ('SPLENDOR WITHOUT DIMINISHMENT')." The display of the provincial flag was authorized by Order in Council dated June 20th, 1960. The Union Jack is symbolic of British Columbia's origin as a British colony and of its continued links with the United Kingdom. The crown in the centre of of the Union Jack represents the sovereign power which links, in free association, the British Commonwealth of Nations. The sun setting over the Pacific Ocean is symbolic of British Columbia's position as the most westerly province of Canada. Proportion is 5 units wide by 3 units deep. When British Columbia became a province of Canada, its first proposal for a coat-of-arms and flag was a half-sun representing BC's western location) in the top half and a Union Jack in the bottom half. When the design was sent to the heralds in the United Kingdom for approval, the heralds were appalled when they realized that the design could be interpreted as "the sun setting on the British Empire." The design was quickly reversed so the sun was on the bottom, giving the flag used today. If you look carefully, there are still a few examples of the original design decorating the legislature in Victoria. I've never seen an illustration of the BC badge that had the sun above the Union Jack. I wonder if it was a real badge or just a good story. Any idea of the significance of the 'ancient crown'? It did indeed exist: I recently saw it, incorporated into a multi-province shield, on an old bank note on display at a coin-collector's shop. I have also seen it in a stained-glass window in the Legislative Building in Victoria, B.C. The flag of British Colombia is indeed a banner of arms and was adopted on 27 June 1960. The lion on the crest wears a collar of three Pacific dogwood flowers (the Provincial flower of BC) to differentiate it from the Royal Crest. The arms were granted on 31March 1906 by Edward VII (with supporters, etc granted on 15 October, 1987 by Elizabeth II) and replaced an earlier unofficial version which the College of Arms found unacceptable. These older arms can still be seen in a stained-glass window in the Legislative Building in Victoria, BC. They were similar to the modern arms but had the Union Flag in the base, with the setting sun above it. The reason given for swapping the two elements around was that "the sun never sets on the British Empire" which is what the heralds felt the old arms symbolized! "The Lieutenant Governor’s Flag is a royal blue flag with the shield of arms of British Columbia in its centre, surrounded by a circlet of 10 gold stylized maple leaves representing the 10 Provinces of Canada. Above the shield is a St. Edward’s Crown, signifying the Sovereign’s representative in the Province. The flag was approved by the Governor General on behalf of Her Majesty The Queen on February 1, 1982. When the Lieutenant Governor is present, the flag is flown at public buildings, Canadian Forces’ establishments, the Parliament Buildings, on Her Majesty’s Canadian Ships and at Government House." The flag is registered on the Public Register of Arms, Flags and Badges of Canada, 15 March 2005, Vol. IV, p. 466, as follows: "Azure the shield of Arms of the Province of British Columbia ensigned with the Royal Crown proper and encircled by a wreath of maple leaves Or." Perhaps this is normal protocol the world over-related to admirals' having their special flags flown when they were (are?) aboard their flagships - but when British Columbia's Lieutenant Governor sails on a BC Ferries vessel - common enough, given the geographic constraints on commuting between the province's capital and largest city (Victoria and Vancouver respectively, of course), the Lieutenant Governor's ensign is flown in place of the BC Ferries house flag. This practice also conforms, I suppose, with that of flying the Lieutenant Governor's flag on his limousine, which I have also seen. I saw this with my own eyes once in the summer of 2003, having just disembarked from a ferry in Victoria. Upon the ship's getting ready for the return voyage for back to Vancouver, the Lieutenant Governor's flag had been raised in place of the house flag. My curiosity piqued, I called BC Ferries the next day to ask about this, and the gentleman I spoke to confirmed that yes, this is the normal protocol. There is the obligatory remark about the flag museum selling out in the early 80s, not yet naming the Tumbling Waters Museum of Flags. 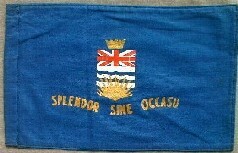 On a blue field, the BC arms proper (including gold) and the provincial motto below it on a wavy line, in gold, ‘SPLENDOR SINE OCCASU’ which I found means “Splendour without diminishment” or more simply “Beauty without end”. It is most likely to be just a souvenir item for tourists. This flag is simply unfit for any official use: The UJ in on the shield has the St. Patrick's Cross in the wrong position, and the St. George's Cross without the Eastern Crown; above it is what looks like a mural crown, rather than the Royal Crown as you would have expected from a vice-regal flag. Miles thinks the crown looks like a mural crown, but I'm wondering if it's an antique crown like the one depicted on the shield. As far as I can tell, there is no crown on the shield, so I'm wondering if there was an error based on a verbal description. The British Columbia Conservation Officer Service has a flag, coat of arms and badge. Information is at the BC govenrment's website. In mid-July, 2005, the Conservation Officer Service, along with Fisheries and Oceans Canada (DFO) and the Canadian Wildlife Service of Environment Canada, hosted the 24th annual convention of the North American Wildlife Enforcement Officer's Association (NAWEOA), in Penticton, British Columbia.As part of the opening ceremonies, British Columbia's Lieutenant Governor, the Honourable Iona Campagnolo, presented the COS with their own armorial bearings consisting of a unique badge, coat of arms and flag. The British Columbia government page shows the 1895 proposed arms, the 1906 assumed arms and the 1987 granted arms. All with supporters, crest etc. The 1906 grant of arms was the shield only and the crest and supporters were assumed unofficially. Even before the official grant in 1987, the full achievement of arms was usually used, sometimes in silhouette on images as small as a letterhead logo. Use of the shield by itself is rare, but it shows up at the top of the page I've referenced, as well as the highway signs. One of the main identifying logos for the Province of British Columbia since 1982 has been the Flying-Flag logo which appears in the centre of our license plates. Around 1983, the British Columbia Government began using a stylized flag as its main logo, although some letterheads, etc., continued to use a silhouette of the Coat of Arms inside a square with rounded corners. Beginning in May '85, the old-style, non-reflectorized licence plates were replaced with plates like the ones in the picture, so that all of the plates were replaced by the opening of EXPO 86 in May '86. There hasn't been a full reissue since then, so drivers who kept the same car, or transferred their plates, can have the same plates for 20+ years. The most recent variant is the Olympic plate which bears no resemblance to the standard plate. On the top left of the Olympic plate is the new logo, introduced with no fanfare in about 2005 or 2006. The stylized flag logo was used through two changes of government, even though it was originally associated with the party in power in the '80s (Social Credit Party). The new logo, seen on the top of the main page at http://www.gov.bc.ca uses the curved shape on the bottom for some reason, resembling the shape of the old logo. The old logo was used with the letters "BC" (no periods, no spaces; other than on the license plates), and the new is usually used with the name "British Columbia", often with the tourist slogan "The Best Place on Earth". 1 Stikine Region is non-municipal entity, governed from the provincial authorities. For statistical and development purposes it is recognized as a regional entity. 2 Islands Trust is a special entity, although its territory belongs to a regional district.